Art & Design by Alexander L. Brown. London, UK-based black/death metal band Lvcifyre released only one other EP, Dying Light Ov God, in 2009, which contained just two tracks. The Callings Depths is their first full-length album ― with so little previous recorded material to go on, it’s striking how balanced their sound is, as is the strength of their chemistry. The duo are practiced and precise, with a wealth of wild, organic energy. Their sound is very much inspired by Immolation and older (by which I mean good) Morbid Angel. However, Lvcifyre emphasize weight rather than speed, which can be heard in the weight of the riffs and the punishing, snare-driven force of the drums. 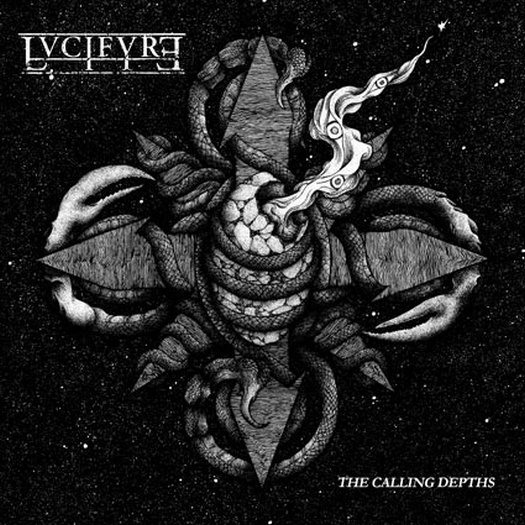 There is still some suppleness in the instrumentation, especially in the guitar solos, and the band are able to keep up a blistering pace, especially in the violent forward momentum of “The Faceless One.” But when Lvcifyre have to make the call, they err on the side of gravity and crushing force. The thick, ponderous tones and almost sludgy aesthetic are lightened with rasping guitars. Lvcifyre appear as an oil slick rainbow in the parking lot of blackened death metal, a welcome, ugly shimmer.